Activision‘s stock was trading down the past week over fears that Epic’s new mega-hit “Fortnite” may be taking away users and monetizing power from Activision’s “Call of Duty” games. Jefferies analyst Timothy O’Shea says that’s a short-term concern, and Activision has “vast opportunities” to monetise its audience in the long term. He says Activision is laying the groundwork to emulate Disney by finding a way to monetise its user base. Watch Activision’s stock move in real time here. Activision‘s stock has slumped recently, but it is poised to reverse that by unlocking the secret sauce that has made Disney so successful all these years – finding a way to monetise its large user base. Disney is the master at getting individuals and families from its amusement parks and cruises, as well as its fan base from franchises like Star Wars and Marvel, to keep coming back to its parks, the movie theatres and its stores to buy merchandise. Disney has found the secret to monetizing its consumers, and it could eventually do that for its planned streaming video service. Activision is along the same path, Timothy O’Shea, an analyst at Jefferies, wrote in a note to clients. With its 385 million active users, it has a “vast opportunity to more deeply monetise its audience,” he said. Activision has already made plans to pivot to mobile gaming, develop its eSports segment, such as its widely-successful Overwatch League, and find ways to bring that content back to the consumer through products, sponsorships and advertising. “We continue to believe ATVI is building a Disney-style entertainment business for the 21st century, but with higher margin,” he adds. O’Shea believes the opportunity is larger for Activision than most content providers because the company’s users are a deeply engaged group, spending around 50 minutes with its content per day. 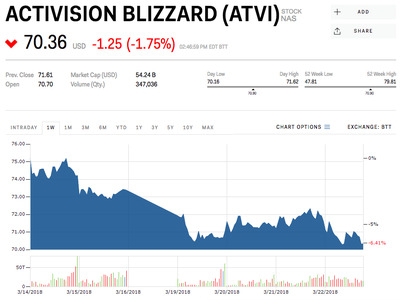 Activision’s stock was trading down 6.41% in the past week over “short-term” pressures due to rival Epic Games’ mega-hit, “Fortnite,” which is said to be taking away users and monetizing power from Activision’s “Call of Duty” games. O’Shea that there is evidence to support this case,but believes that this will not last long given its Disney play. He also sees the current weakness as presenting better buying opportunity for investors. 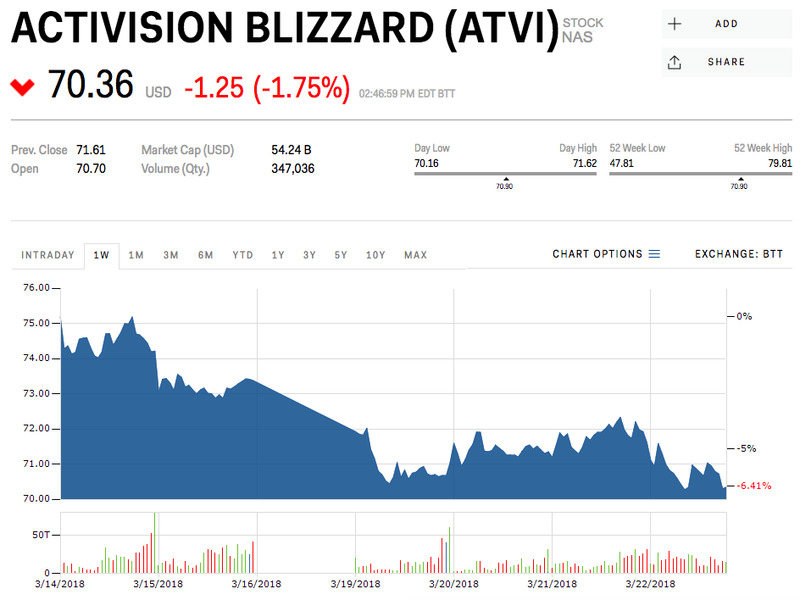 “We are predisposed to aggressively buy the dip given there is no change to our positive long-term stance on ATVI,” he wrote. O’Shea maintained his price target to $US86 per share, with a “Buy” rating. Activision’s stock was down 1.75% on Thursday at $US70.36 per share. It was still up 9.49% for the year. Read more about how Activision’s pivot to mobile may be its best bet yet.